We are London's premiere large format digital printing company that specialise in the print and design of large display graphics for any kind of promotional display for marketing and advertising, from small advertising banners to conference graphics and branding and complete exhibiting solutions at exhibitions and trade show events throughout the UK, but more specifically in central London UK. Stand banner provides a printing service for all London companies wishing to exhibit at any venue, from Earls Court, Business Design Centre, Excel, Olympia plus many more conference centres based in Hotels and gallery's. 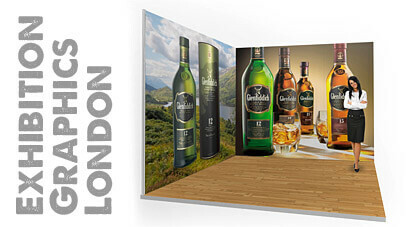 With a showroom in the UK capital you can visit us for free friendly advice on all your exhibiting or marketing display stand requirements, we can advice on the best stand for the best venue or even deliver to your exhibition venue making your exhibiting experience as simple and as pleasant as it could be. We have more than 25 years experience in digital printing for trade shows and promotional exhibiting for every kind of advertising and marketing requirements, from simple poster printing to complete event back drops you can depend on us to deliver the very best in digitally printed graphics for every solution including internal and external display printing. If you need to re-fresh or update your banner stands we offer a fast cost effective solution for new banner graphics that can be delivered within 24 hours to any UK exhibition venue or destination and even a same dame day collection from our London office. This banner service is designed to give you the cheapest and simplest print solution that is environmental and easy. We print a wide selection of banner graphics for types of types of banner stands UK including big banner stand up to 3 metres wide in a variety of qualities suitable for every budget and ideal for internal or even external use depending on your marketing requirements. Our quality print service is ideal for all companies looking to re-furb and old stand and give it a new lease of life, with a print solution that fits every bill and budget. We print at amazing high resolution to deliver super sharp backdrops with photo likeness that is not equalled. If you already have a pop up display company uk and all that is needed is new graphics or you could even borrow a stand from another company and just get new graphics for your pop up this will minimise the cost. Replacement graphics are the most cost effective way to exhibit and are real environmental option. We print our exhibition graphics at the highest resolution available and produce colour intensive and photo quality graphics that are pin sharp and are more life like than our competitors. All our exhibition panels are produced in-house by trained staff and all our print technicians have been trained to Adobe standard. Graphics are produced on a number of machines depending on the use of the stand and then are finished with a protective laminate that is UV resistant and will protect against scuffs and marks, also it is anti-glare so your images remain viewable at whatever angle. Finally the panels are hand finished and inspected for quality. 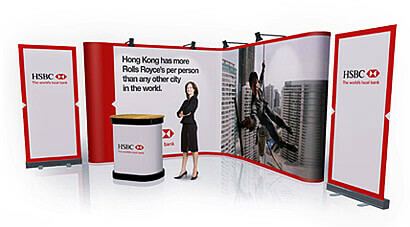 which also includes exhibition and trade show display stands plus portable exhibition banner stands. We design, print, and manufacture all under one roof so we can ensure that you receive your exhibition stands as quickly as 24 hours after you place your order, in time for your important event, presentation, conference, or trade show. We achieve fast turnaround times with such high quality results by utilizing our many years of experience in the print and manufacture of exhibition display stands to the point where we have streamlined the production process, enabling us to get your stands made quicker than most other companies. Customer feedback has indicated that our speed and reliability has enabled them to attend a last minute exhibition when the opportunity arises, secure in the knowledge that we could provide the necessary display items in time and within budget. Our 24 hour digital printing service is available throughout the UK mainland with delivery times as early as 9am the day after you place your order. As an internationally recognised and respected trade show display supplier, we also ship to Europe and across the globe within days of an order being placed. We are often asked to manufacture displays for international clients who are exhibiting in the UK and want a reliable exhibition supplier to deliver their stands to the exhibition venue on time. For more information on the terms and conditions of our 24 hour production service, our delivery methods, or with just a general enquiry, feel free to contact us via e-mail or telephone and speak to one of our knowledgable sales advisors.